Главная » Hunting with of prey and hunting birds traditional in Kazakhstan. Hunting with a falcon and golden eagle. Hunting with falcon in Kazakhstan. Almaty - top Kaskelen a road - natural boundary Ush-Konyr - Almaty. Distance of route: 108 km. The Best time for travel: April - October. The advanced order: for 15 days. The purpose of tour: acquaintance to the nature of Kazakhstan, customs and traditions of Kazakhs, ancient tradition which hunting with hunting birds is. The foreword to hunting with falcon in Kazakhstan. Sunkar Falcon Centre in Almaty. … The Hunter with a falcon leaves in a floor. The hunter removes from a head of a bird Klobuk and releases it. The bird take wing up, sees prey and attacks … Then the hunter holloa turns beside, then a bird to itself. Hunters holloa a bird the whistle, a special word (for example, «Ke!»), someone holloa a bird by means of Vabila - scarecrows with the bird's wings. Vabila untwist, and the bird, with the hunting instinct, fly to hawker. Falcons do not have instinct to be subordinate, they do not perceive the owner or the chief. Over this bird not probably to operate and supervise. The unique opportunity for hawker - to be to a bird the friend. The falcon will come back to the hunter again and again if he trusts the person. The falconry exists everywhere - from Japan up to Switzerland. At all times this hunting was special employment, such hunting named imperial. Each governor had the hunting birds. In the Kremlin, for example, 25 years special falcon service, which main task already there are more works - to drive away a raven, dove and other towns birds from protected territory of the Kremlin. Speak, this service have created, when raven it "turn up" in immediate proximity at high the Soviet heads. So or not, but now to ravens in air space of the Kremlin to fly it is impossible. Golden eagle in Kazakhstan is the birds of eagle class and birds of prey. The size is 95cm, the wingspread is to 220cm, the mass is 6 kg. The feathering is of the same kind, dark-brown. The back of the head and the neck is golden-red. Young eagles have white tail, with widen black stripe, the low parts of the wing with the large white spots. The eagles female lays 1-3 eggs in April-March fertilize about 45 days. Under the natural conditions the eagle lives 100. It feeds on: in the mountains – by marmot, gopher and etc, in deserts-snakes, hares, partridges. The eagle is used for hunting. Hunting with a golden eagle Kazakhstan. 08.30. Big Almaty gorge - town Almaty - top Kaskelen road - valley Ush-Konyr (58 km). Transfer to a place of hunting. Our way lays lengthways root of a mountain (local name - Prilavki) Zailiiskiy Ala-Tau on the West. We pass many settlements on «The Top road Kaskelen». Approximately, through 50 kilometers the streamer in natural boundary Ush-Konyr begins. The panorama constantly varies, we shall stop on viewing point and at the sacred springs decorated multi-coloured sacrificial pane of a fabric. Arrival on dzhalyau. At Kazakh yurts us meet traditional tea, kumys (horse milk), airan (yoghurt), baursaks and the flat cakes prepared here on open fire. Around yurts at horse standing stand saddle of horses, and just in the party - the main place of interest of Kazakhs - hunting birds. Hawker (Kusbegi, Berkutchi) tells about traditions of a falconry. Visitors can photograph hunting birds - an eagle owl, falcons, a golden eagle, can dress a special glove on a hand and even to take on her a bird and to feel its force, to feel the hunter. Here it is possible hiking to visit vicinities and to see interesting plants, stones, birds, insects and kowtowing. 11.00. Walk on horses in vicinities of natural boundary Ush-Konyr. On horses we go on natural boundary Ush-Konyr. This very picturesque hilly plateau with flat downturn and gorges with springs and streams at height 1500 - 2500 meters above sea level. Here flowers paint slopes in the most different paints. 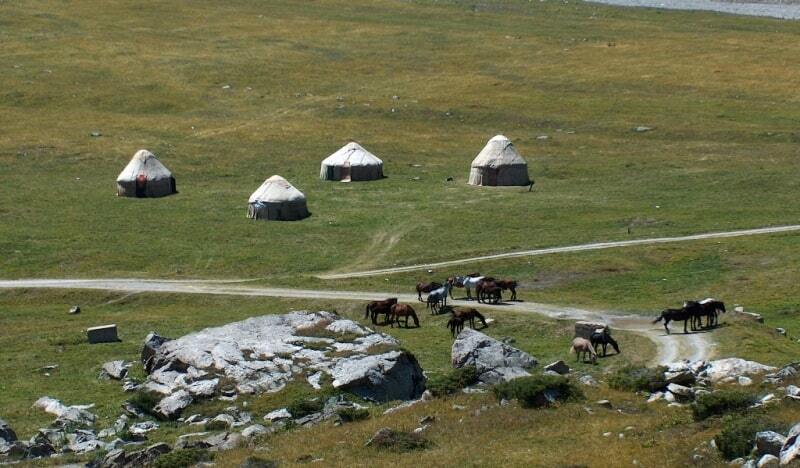 Traditionally such mountain meadows serve as years pastures - dzhailyau on which herds of horses and flocks of sheeps of local residents are grazed. We pass by mountain lake where there live flights red ducks-ataiki and if to us will carry, it is possible to see and black storks, we pass herd of horses with frolic foals, we cross streams, we hear whistle marmots. Here it is possible to meet roe, foxes and even wolves. On a mountain plateau in snow-clad mountain ridges there live mountain goats, marals, argali, bears and snow leopards. Soon we come nearer to a place of our riding walk, we rise on a hill and before us the magnificent panorama and greater flight of huge predators-scavenger opens. Some of them majesticly turn in the sky, others sit at a dead animal, having seen us they depart and rise in air, floating above us on motionless wings. These are black gryphon, griffon, (Gyps himalayensis) Himalayan griffon, bearded men, hooded vulture (Necrosyrtes monachus), different kinds of eagles and kites. 12.00. Valley Ush-Konyr. Indicative hunting with hinting birds. We come back to yurts. Hawker shows receptions and methods of training hunting birds, the arrangement and function of equipment - Vabilo, Putsy, Klobuchki, gloves, etc. For physical training falcons, for their endurance, and speeds work on vabilo is shown to a maneuverability. The falcon departs, gains height and promptly dives on hawker, trying to seize vabilo. Hawker, on a cord twists vabilo above a head and dexterously pulls Vabilo, does not give its falcon ahead of time. After several such dizzy attacks hawker enables a falcon to seize the extraction, the proud and happy falcon falls on the ground and receives in the award meat. Then hawker shows interesting feature of falcons - «hunting for insects». In the nature large a falcon while occurrence of good prey wait, the pigeon for example, find greater insects - dragonflies, bugs and other insects. Hawker throws a falcon and the falcon departs, gains height and starts to turn pending "prey". On imperceptible gesture hawker the falcon dives on it and dexterously the slice of meat suffices a paw thrown in air small. The bird rises upwards and swallows "insect" directly in air, then flies on following call. In summary hawker throws highly in the sky vabilo and the falcon forces down it, as a bird. 13.00. Valley Ush-Konyr. 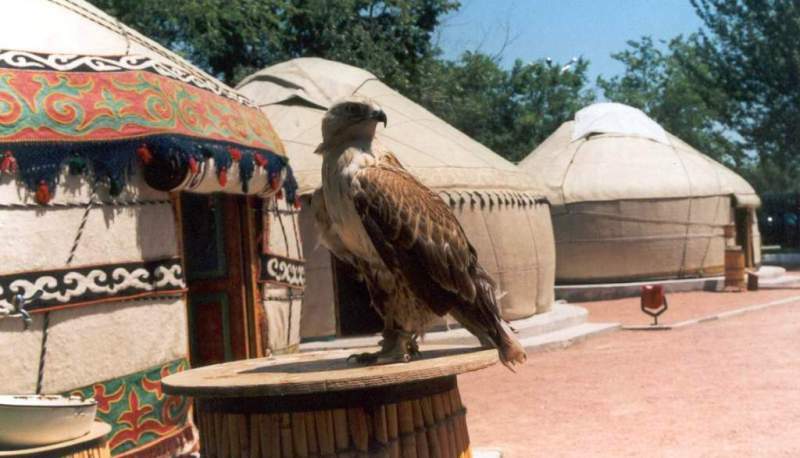 A lunch in Kazakh yurt. Lunch in yurt or on open air on carpets and on a grass. Traditional Kazakh dishes - Beshbarmak, Syrne, a head of the ram, salads and local fruit. 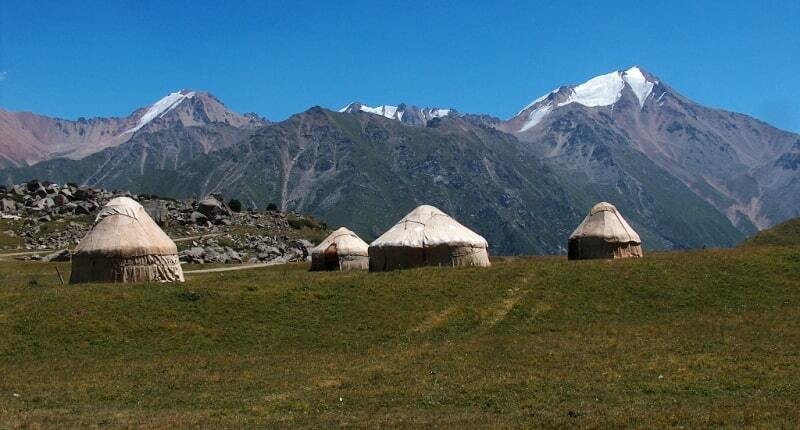 Visitors talk to owners yurt about a way of life of Kazakhs, about family traditions of Kazakhs, about cooking. Many questions are addressed and hawker-berkutchi. 14.00. Hunting with a falcon on wild animals. On horses to go for hawker which carries on a hand a symbol of Kazakhstan - a bird represented on a flag of Republic Kazakhstan - a golden eagle. To find prey for a golden eagle not simply. Hares and artful foxes are hidden in remote gorges and bushes. After several hours of hunting hawker to go forward and the golden eagle finds prey. He jumps off from a hand hawker does sharp turn through a wing and he falls in a grass here attack a hare. Tourists and visitors observe of hunting of a falcon for a hare. 18.00 Returning in Almaty (50 km). Is cognitive-adventure tours in Kazakhstan. Hunting occurs to a falcon on the open air, many details of hunting depend on a season and weather, and as physical preparation of participants (riding, on a motor vehicle or on foot) hunting birds, at will of the customer it is possible to change structure and quantity.